After losing in the divisional round of the playoffs to the Broncos it became clear wht the Colts needed to do to thier roster if they wanted to have a chance at a SuperBowl run. I would not say that last season was a dissapointement but rather last season was a season to get younger at certain positions. It became apparent that we needed to upgrade our offense, especially at the wide reciever position. The goal in Indy has been and always will be to win the SuperBowl. As I enter year four here in Indianpolis I have great confidence in the moves that were made this past offseason and I feel it is the best roster from top to bottom I have put on the field. WR Will Fuller- We reached a deal with the Cowboys to get this WR. It was an immediate upgrade. He alone will take alot of pressure off of WR WIlliams. WR Williams carried this team last year and his season is in the PFL record books but we understand that you cannot win with a one trick pony. Willer will start at WR2 on day one. WR- Corey Brown- We reached a deal with the Chargers that send this WR to us. We like to run alot of 3wr sets. We didnt have that threat last year and over and over the course of our seaosn we would see this position make drops or errors is key situations. We are thrilled to see how the tandem of WR Williams, Fuller, Brown, and Hawkins can do when they are on the field. HB- C.J. Prosise- We truly wanted someone we felt comfortable with and someone who would compliment HB Williams. Williams had a good rookie season and we look for him to improve but we run alot of spell back so this is a guy that brings alot to the table. He has the speed and has outstanding hands. We will utilize him for both and again he adds another offensive weapon to our stable. QB Andrew Luck- UFA1- Had to bring him home. He never looked right in a Raiders uniform. It is undetermined if he will be our starter because we have a young guy who will be given the chance to lead this team. It will be determined before week one if Luck will start or be ready in case Kizer slumps or gets injured. We selected MLB Tam Noduj at 4.25. We had our eyes on a FB...which ironically enough we were able to snag in UFA2. So it worked out very well. We run a hybrid of 3-4/4-3 and with his chances at a rookie boost it could make him into a solid MLB. We will pump some TC points into him but we were very happy with this selection. 4.30- We drafted P Riley Dixon. We left McAfee go in the offseason so we knew we needed to secure a punter ini the draft. NBothing special but he should be able to get the job done. 5.25- FS Jermaine Peters- With a good rookie boost he could actually be a solid player. If not then he is cheap depth at this position. These are just some of our offseason notable additions. We are extremely excited for the 2021 PFL season and as I have stated before we feel this is the best roster from top to bottom that we have assembled. We also stayed young. All the players added have so many years left in their careers so we should be able to substain success for the long term. We have some tweaking to do to our offense but that will be addressed before week one with some scrimms. Time is of the essence to get these players plugged in and develop the chemistry that will be needed for a strong 2021 season. We addressed mainly offense this offseason because we feel our defense is already good enough to win now. We shall soon find out if the moves we made in the offseason will be good enough to take the throne that currently resides in Denver. Last night the Indianapolis Colts traveled to Pittsburgh with a stake of the winner going to the Superbowl on the line. The Colts were able to outlast the Steelers and win the game 23-16 in what was another epic, down to the last play game. The defense early on in this game was just incredible on both sides. The Colts were able to get a few turnovers early in the game and converted those opportunities into points and would take a 10-0 first quarter lead. Each team would exchange field goals in the second quarter and the Colts felt good going into halftime leading 13-3 but we also understood that this game was far from over. The Colts first possession of the second half would see the Steelers pick off QB Bradford and return it for a touchdown. This made the score 13-10 Colts. Both defenses in this game played just spectacular and after three quarters the Colts would hold a slim lead 13-10. The Steelers would tie the game up in the fourth quarter after a made field goal. The Colts just seen that ten point lead evaporate and was concerned because the lack of offense they so far produced in the game. QB Bradford hit rookie WR Pritchett on a post corner route. He would make the catch and rumble 64 yards in for a score to put the Colts up 20-13. The Colts would add a field goal and would take a 23-13 lead with if i recall just over two minutes to go in the game. The Steelers would drive down and with around 51 seconds in the game would elect to kick a field goal, which would end up being good. This cut the lead to 23-16. The Colts setup for the onside kick but the Steelers kicker kicked one hell of a kick. The Steelers would recover the onside kick. Our job at this point was to do whatever we could to keep the Steelers out of the end-zone. The Steelers would drive down the field and it came down to a fourth down play with just four seconds remaining in the game. The Colts defense made the stop and the clock hit 0 and Colts fans and players started celebrating! Coach Goodman said after this hard fought game that he was very proud of the job the defense did in this game. The offense was not pretty at all but we did just enough to advance. Neither offense could really do much of anything except for drives here and there and this game was all about both defenses and making each offense pay for their mistakes. A total of seven turnovers in this game. A big congrats to Jim Hatzis because no matter the score he kept at it and it was a very wild finish. The Colts secured a spot in the SuperBowl for just the second time in franchise history. They will either play the Panthers or the Cowboys. This will be coach Goodman's second trip to the Superbowl in three PFL seasons. I would want nothing more than to bring a championship to my favorite team and we are on the cusp of seeing that as a reality. We know we have some work left to do and we will begin to prepare for the winner from the NFC. The Colts theme for this season was taking care of business and we are almost there. The season has had its moments but the defense has played stellar this season. There was concerns early in the season after trading three starters to Kansas City for the electric wideout Williams but I feel as though we have found our groove on defense. The Indianapolis Colts have been rather quiet this season when it has to media outlets and posting. Honestly there was not much to write about. The Colts started strong and ran away with the division. After bouncing Zeke and the Broncos from the playoffs they are once again setup with a showdown with the Pittsburgh Steelers. The Colts will again travel to Pittsburgh as they did last year. The game last season came down to the wire and the Colts missed a long field goal that would have won them the game. They get a shot at redemption this season and once again the stakes could not be any higher. Winner goes to the Superbowl. Colts coach Goodman said his gameplan will come down to three things. 1. Get Mr. Hatzis drugged up before the game. 2. Cut the wiring to his controller right before our game. 3. He has already paid the electric company for the week. In all seriousness I look forward towards the game against Jim. I always do. They might not end the way I want them to end but they normally have come down to one possession games and I expect this game to be no different. This will mark the third year in a row that Coach Goodman has made it to the AFC Championship game. It's now is time to execute and send Steelers fans home in tears! The Colts went into the off-season understanding that they major overhaul of the wide receiver positions and wanted to get younger on the offensive line. The defense remained for the most part unchanged. It was critical for us to make moves to get players that will help us move the ball on offense. Move 1: We came to an agreement with the Chiefs that would send RE Hoard, MLB Williamson and FS Campbell in exchange for 1.1. This was all about getting the best WR in the draft. It is what was lacking on this team last season. We had alot of old slow guys at the WR position and we were out too bring at least one play maker this off-season. We already had a backup and young MLB in Perry and we had another deal in place for a RE. So we felt as if we were mainly really going to need to replace the FS starter and we felt having the 1.1 we would be able to get the best player and fill the FS position later in the draft. Move 2: We traded our 1.30 to the Cowboys in exchange for RE Mingo. This trade evolved mainly to replace RE Howard we just shipped to the Chiefs. It is a little weaker than Howard but we fill he will fit in our system just fine and we expect no less out of him than we did RE Hoard. Move 3: We shipped TE Funchess to the Panthers in exchange the Panthers 3.32 pick. We wanted to acquire some later round draft picks because we felt the draft was deep enough in some of the positions we were looking at. We also was retooling the whole receiver core and he was expendable. Move 4- We traded next years 2nd round pick for C Hroniss Grasu from the Ravens. Hroniss is still very young and will come in and be our rock at center position for many years to come. He is already an outstanding center and we will only improve the rest of his career. QB- Sam Bradford- We got him pretty easily and he will run our offense this season. There is no doubt we do not have confidence in QB Manuel so we had to go get who we thought would be able to run our offense and we think Bradford will do a great job. HB- Don Irvin- Mainly a depth pickup. The talent at the HB position fell off so fast if the starter went out and we wanted to add quality depth. FB- Emil Igwenagu- We felt last season our FB under performed. We went out and grabbed a veteran FB with decent AWR and decent blocking skills. He will be critical in the run and passing game picking up the correct lineman/linebackers to help us run the ball or pass the ball. WR- Derek Carswell- Mainly a depth pick here but we liked his size and speed is ok. His catch is low but he is still a very young player and could be developed. 1.1 WR Tyrell Wiliiams- The Colts felt they added the best receiver in the draft and a great play maker for many years to follow. Getting WR's and very good depth at this position was priority number one this off-season. He is a day one starter. 2.30- LG Trace Whitehead- We had him ranked as the 2nd best LG in the draft and was blessed he fell to 2.30. Our current LG is getting up there in age and we felt at 2.30 he was the BPA and he will be a day one starter. 3.30-SS- Ibraheim Campbell- We felt like he will be a great addition to the Colts secondary. He is a bit shorter than what i like historically but he will do just fine and add in some help in a rookie boost then he will really be very good we fill. He is another day one starter. 3.32- WR Andrew Hawkins- It was no surprise here because last season the Colts return game was dreadful and most time i would close my eyes on returns. We had way to many turnovers resulting from muffed punts or fumbles. This is why we drafted him at 3.32. This will be his main duty and that will be to return punts and kickoffs. He also already has great catch and will be used on occasion in the offense. 4.30- RG Patrick Ware- Has raw athletic ability that we are going to put to the use right away. We will develop him and we were a bit surprised he was still on the board at 4.30. He is a day one starter and will replace our veteran RG immediately. 5.30- WR Jaquan Pritchett- We love his size and again with a little help from a rookie boost he could be an X factor on offense. He will be a day one starter and we work with him in training camp to get him up to speed but we feel at 5.30 we got tremendous value here for this WR. The Colts offensive line got alot younger. We now have each of these positions locked up for the next 8-10 years and feel they are very good lineman. The WR depth has been reworked and we have the kind of players we like at this position. Two rookies will get the starts but we have some good veterans that will step in and play for us this season. The HB position is still a question mark. We will see how the group performs this season but currently we know Gillislee will be the man starting and will mess around with the depth. We hope that HB Irvin can slid in at the #2 position but time will tell. The TE position the Colts will go with youth and Kroft will get the starting nod over TE Bishop. We feel he needs the playing time to develop into a good TE. So the offense will have many rookies playing so time will tell if it all pans out. We are going to be young, inexperienced on offense but I think these guys can make plays. Only time will tell as the season is vastly approaching but we feel real good going into the 2019 season on what this team can accomplish. It doesn't mean they will accomplish it but we will give it our best shot. The Colts lost in the AFC Championship game tonight in Pittsburgh 16-14. It was a very tight game and a very well played game by both teams. Congrats to Jim Hatzis and his Pittsburgh Steelers for advancing to the Super Bowl. Coach Goodman was asked after the game how he felt his team played and he said he thought his Colts team left everything on the field tonight. It was a battle as we expected and he played about as good as we could have and just came up wide left. He said he has still nothing but confidence in his kicker. To have a young kicker out there with all the pressure in the world to hit the field goal is a tough situation. A big thorn in the side of the Colts all night was WR Matthews. Coach Goodman said he was just oustanding and played one hell of a game. The Steelers defense played as they are advertised. You have to battle to get each yard. We were able to get their defense a few times in the game but overall they were flat out amazing. It has been a very good season for the Colts and first year Coach Goodman. We respect the Steelers and Jim Hatzis and wish them the best in the Super Bowl. The game was show on live tv for all the PFL to watch. The game did not disappoint them at all said Coach Goodman. It was a highly hyped game and I believe both teams showed the PFL a good game. All you can hope for against the Steelers and Mr. Hatzis is a chance in the end of the game and we had that chance and and it missed just wide left. We will take time to evaluate our roster and begin our off-season work to hopefully come back next season stronger. We are proud of this Colts team of what they accomplished this year and we hope it will continue to build in the many years to come. We are young on defense and we will tweek the offense this off-season and come back strong next season. In closing Colts Nation would like to say once again congrats to the Steelers and their organization on advancing to the Super Bowl. The Steelers will try and win another Super Bowl in the famed Mr. Hatzis' career and will try to keep that trophy in the AFC. The Indianapolis Colts defeated the Buffalo Bills last night 24-20 to advance to the AFC Championship game. It was a very hard fought game. The Colts would score a touchdown with around 20 seconds left in the game to take the lead. Coach Goodman would like to say to the Bills organization congrats on a very stellar season and also say what a unbelievable game they played last night. It was close throughout the entire game and very well played. Now enter the danger zone of what the PFL calls Jim Hatzis and his Pittsburgh Steelers for the right to represent the AFC in the Superbowl. We understand the task ahead and the mountain that we must climb if we are to be victorious on Sunday night. It is ironic that ten years ago (2008 season) that the Colts went to the Superbowl and even then they had to go to Pittsburgh and win to reach their only Superbowl appearance in the PFL. We will try and accomplish the task that the 2008 team did and that was get a win against the Steelers to punch our ticket into the SuperBowl. Coach Goodman and Coach Hatzis are very good friends and it is a honor to play such a competitor in such an important game. We played a few times last season when I coached the Ravens and both games came down to the wire. Coach Goodman is trying to get back to the Superbowl for the second time in a row with different teams. We will begin to gameplan for the Steelers team but we know it will a tall task to pull off a win in Pittsburgh against Hatzis and all the fans that will have the stadium full. We would like to thank all Colts fans who have supported the team this season. It has had its ups and downs but we have stayed the course and find ourselves one win away from the ultimate goal and that is to reach the SuperBowl. We have our challenges that we will have to deal with as we have all year but our team has been resilient all season. the offense has came through in clutch situations and the defense has been stellar. The game will be broadcasted on Sunday night at 8:30pm for the PFL league to watch the Colts take on the Steelers. This AFC Championship game feels as the most anticipated game the league has been waiting to see. Evyerone wanted to see it last year but the Steelers fell to the Bengals in the playoffs. We have the Hall of Fame Coach (Jim Hatzis) trying to make another run at a PFL SuperBlowl win and a Coach Goodman who is trying to cement his place in PFL history by reaching the Superbowl for the second straight year. It should be an epic game and we look forward to the challenge. As the video link states.....tomorrow at 8:30pm......its going down!! The Indianapolis Colts are the 2018 AFC South Champions!! They also secured the #2 seed and will start the playoffs with a bye week. They finished the regular season at 12-4. It was a season with many ups and downs but first year coach Goodman is very proud of this group that remained focused and got the job done. The Colts got off to a very fast start and went 9-1 but then some struggles started to happen. They would drop their next 3 games. Coach Goodman made some adjustments on both offense and defense and it would pay dividends as they would finish the season on a 3 game winning streak. We knew going into the season that our defense would be pretty good but we had some concerns on offense. While the offense has not been stellar this season it has came through in clutch situations. After we were 9-4 we made some adjustments and it appears to be paying off. The Colts will take the bye week to prepare mentally for the challenges that the playoffs present. There is no tomorrow in the playoffs and we will need to be perfect in our execution to our gameplan if we want to advance in the playoffs. These are the best of the best teams that are in the playoffs. While we are thrilled to have the #2 seed it does not guarantee us anything. We will have to take care of our business. The Colts will lean heavily on our defense in the playoffs. We feel we are playing pretty good on this side of the ball and its a must when you get in the playoffs. They will need to play big for us to advance and we expect them to play good football. The defense needs to mirror that Ravens defense last year in coach Goodman's Ravens Super Bowl run. It will take that type of effort. We feel they can rise to the occasion. The offense plan is simple. Do not turn the ball over in the redzone. This has plagued this team all season and the Colts are hoping that they cash in when they get into the redzone in the playoffs. The erratic QB play of Manuel we hope will be better after progression but he will we are a very short leash. The offensive line should play better after progression so we think Manuel will have just a little more time to make the right reads. The run game will need to come up big for us and I think it can. I am very proud that in my first season with the Colts we were able to take the division crown. We got a very late start with the Colts and free agency, the draft and other things were completed so we played the cards we were dealt and to take the division in our first year is step one into building this Colts team into a year in year out winning organization. 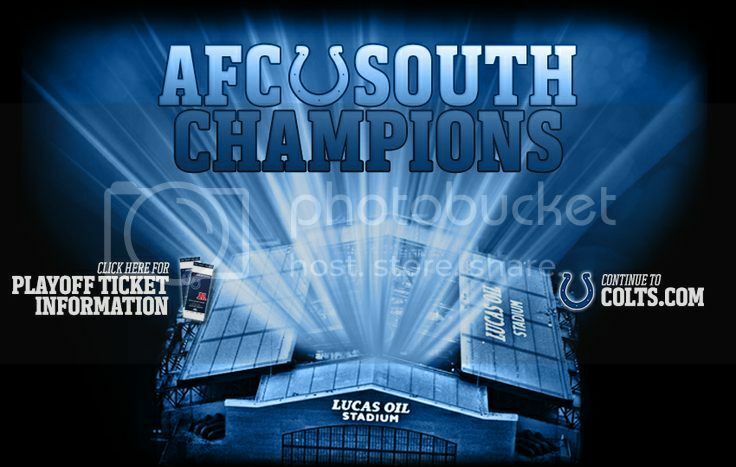 There will be changes in the offseason but right now its going one game at a time to reaching our goal and that is bringing the Super Bowl trophy to Indianapolis!!! All Colts nation will pack Lucas Oil Stadium in a few weeks and host the divisional round playoff game. We hope to give the fans what they deserve and that is a well played game and obviously we hope for a Colts victory!! The Indianapolis Colts traveled to San Diego this week to take on the Chargers. The offense for the Colts played better than the previous two weeks and the defense did just enough to leave San Diego with a win. 2nd Quarter- Qb Clausen came in for injured QB Manuel and Clausen would hit WR Stills on a 15 yard score. The Colts would grab the lead 14-13. San Diego again responded with a 75 yard drive but again the Colts would hold them to another field goal but it would give the Chargers the lead at 16-14. With just over 3 minutes left in the half, QB Manuel would find TE Funchess for a 24 yard touchdown strike and would put the Colts up 21-16. The Chargers came right back again with a very nice 75 yard drive and it would end in a touchdown for HB Johnson crossing the goaline with just over a minute left in the half and again the Chargers would regain the lead and go in at half up 23-21. 3rd Quarter- Running back Gillislee would scamper on a 8 yard touchdown in the quarter that would give the Colts a 28-23 lead with just under 4 minutes left in the third quarter. 4th Quarter- The Colts had a nice 12 play 81 yard drive that would again see running back Gillislee score a touchdown from 2 yards that increased the Colts lead 35-23. The Chargers would again intercept a pass and would drive down the filed to the Colts 1 yard line and have first and goal. The Colts defense came up big here. First down stuffed the run....2nd down again stopped the run... 3rd down pass incomplete...and Chargers went for it on 4th down and the Colts were once again able to get the stop and would get the ball at the 1 yard line. The defense would again stop the Chargers on a 4th and inches and retain the ball and when the buzzer sounded the Colts would leave Sand Diego with a 35-23 win. First off the Chargers played a very good game. The Colts defense did not play the way we expected them to play. The offense that has been stagnant for the past two weeks played well though.The offense carried us in San Diego but the defense did settle down a little in the 2nd half of the game. None was bigger for the defense that the 1st and goal at the 1 yard line and to stop the Chargers four straight times really was the difference in this game. The Colts also made a change at halftime and put in QB Clausen who played well. Coach Goodman did not have a comment after the game would will start next week against the Denver Broncos. The Colts moved to 7-0 on the season and they get to see the great ZEKE next game. He has had an outstanding rookie season so far and one for the PFL record books so we know we will have our hands full trying to keep him in check and the Broncos offense. Cleveland, OH [IP] The Indianapolis Colts traveled to Cleveland this week in the PFL and after subpar first half performance they were able to put together a strong second half and left Cleveland with a 31-10 victory. 1st quarter- The Browns would benefit from an interception for the Colts QB Manuel. The Colts defense would hold the Browns to a three and out and Cleveland would settle for a 27 yard field goal. 2nd quarter- The Colts offense started moving the ball and they would go on almost a 83 yard drive that took just under 4 minutes but would have to settle for a field goal but would tie the game up at 3-3 with 2:42 left to go in the second quarter. The Browns wasted no time and they immediately went 86 yards on 9 plays and Manziel would find Lippett for a touchdown with 14 seconds left to go in the half. The Browns would go in at halftime leading the Colts 10-3. 3rd quarter-The Colts would receive the ball and they drove the length of the field and QB Manuel would find TE Kroft for a 10 yard touchdown pass to tie the game up at 10-10 with just under 8 minutes to go in the 3rd quarter. The Colts would strike again with just over 4 minutes to go in the 3rd quarter when QB Manuel hit WR Baldwin with a 80 yard touchdown strike. The Colts would head into the 4th quarter in a close game but was up 17-10. 4th quarter- The Colts would pin the Browns at their 1 yard line. The Browns tried to pass and Manziel was under pressure so he scrambled and fumbled the ball and the Colts recovered at the Browns 3 yard line. Two plays later HB Gillislee would gallop into the endzone and give the Colts a 24-10 lead with just over 6 minutes left in the game. Gillislee was not done and the Colts next drive he broke a few tackles and was off to the races and would take it 61 yards and score a touchdown. That would put the Colts up 31-10 and when time ran out the Colts would move to 3-0 on the season. GM Goodman really believes that the fumble by Manziel changed the game. That was a big moment in the game and we were very fortunate at that point in the game. We played a horrendous first half and the Browns defense was very stout. I was pleased that we woke up a little in the 2nd half of the game. I was pleased that our defense was able to keep us in the game until our offense got going. We are glad to be heading into our bye week 3-0 because we have a very tough stretch of games coming up in this young PFL season. Rookie MLB Perry played very well in this game and we needed that because our starter went down and it appears he will miss the next two weeks. This game took a toll to win because we lot both of our starting OG's. RG Reiff was a significant injury and will miss at least the next 11 weeks and LG Hollings will miss the next two weeks. The Colts on the season have been hit early with the injury bug but DT Edwards who has been out because of injury made his return. It appears our defense is steadily improving with reducing the yards per game each game and we will need that because our offense is not where it needs to be. We show flashes at times but the pass game is not consistent enough at this point. Very proud and happy with the run game and we will continue to search for the pass game. The Colts are on the bye week next week and then in week 5 play host to the Raiders. That should be a challenge and we will need to be ready for that offense when it comes to Indianapolis.